Introducing the EZ Witness personal security DVR! We created the EZ-Witness to meet the needs of our customers who desire a simple, yet dependable surveillance solution. The EZ-Witness is especially catered to homeowners and students; as well as professionals working in a cubicle type environment where privacy and security are not ensured. We've made it easy -- no VCR to set up, no software to install, simply place the EZ-Witness where you wish to capture video and it will automatically digitally record fast-action snapshots or video when motion is detected. Playback on your own TV, and save recordings to your VCR or PVR it's that simple! 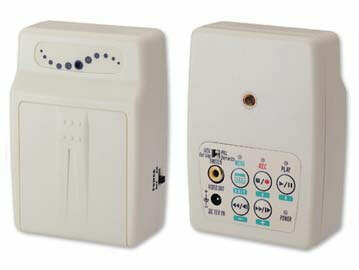 The EZ-Witness is a color camera with 64 Mb Flash RAM for motion or constant recording at 640x480 or 320x240 mode. -Can be mounted to a wall via the included tilt/ swivel bracket, or just set on a desk or counter top. Simple, discreet, and self-contained, the EZ-Witness digital recorder is designed with your personal or professional security needs in mind. Once you receive your new EZ-Witness self-recording camera, you are just minutes away from actually recording video in your home, dorm room or office!